COMPANY PROFILE AIA Group Ltd is a pan-Asian insurance provider with a wide range of products including retirement savings plans, life insurance, and accident and health insurance. The firm also provides employee benefits, and pension services to corporate clients. AIA Group Ltd is a pan-Asian insurance provider with a wide range of products including retirement savings plans, life insurance, and accident and health insurance. The firm also provides employee benefits, credit life, and pension services to corporate clients. AIA is present in 18 markets and serves the holders of more than 30 million individual policies and over 16 million participating members of group insurance schemes. 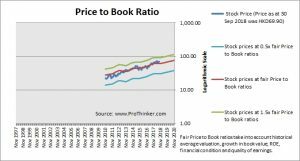 At the price of HKD69.90 as at 30 Sep 2018, Aia Group Ltd is trading at a Price to Book Ratio of 2.6 times current book value. 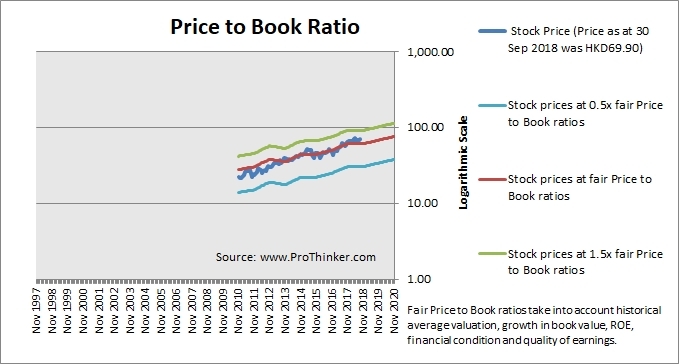 This is a 15.0% premium to current fair Price to Book Ratio of 2.2 times.